Anhydrous Ammonia is a chemical compound that is classified as toxic, dangerous for the environment, flammable (in gas form), and can be explosive when mixed with air. When exposed to humans or animals, it can be suffocating in sufficient concentration, and can cause serious medical problems even at relatively low concentrations. Ammonia that most people use in their homes and businesses is actually diluted with a significant amount of water. Anhydrous ammonia is the pure form, which can make it much more hazardous. Due to the dangers associated with this chemical, it is highly regulated and must be stored and used properly in order to avoid causing damage to people, animals, or the environment in general. Anhydrous ammonia is used for many things in a variety of different industries. Much of it is diluted with water to be used for cleaning products in homes and businesses around the world. The undiluted chemical is used as a fertilizer by compressing it into a liquid. This is an efficient way to add nitrogen into the soil. In large farming areas, it is not uncommon to see tractors pulling large tanks of anhydrous ammonia through the fields when fertilizing. In the pharmaceutical industry, it is used to make a variety of medications. It is also used illegally for the production of methamphetamine (meth) a dangerous street drug. It is necessary for these things as an intermediate step to form other chemical compounds. Ammonia is also used as a refrigerant, especially in industrial sized refrigerators and freezers. It is an efficient option, and when maintained properly, can be environmentally friendly compared to many other types of refrigerant. There are other industrial uses for this chemical as well. No matter the industry, if this hazardous chemical is on site, it is critical to have a safety plan in place that will cover the dangers of anhydrous ammonia, how to respond to an incident, and other factors to keep everyone safe. In most industrial, pharmaceutical, and agricultural situations, anhydrous ammonia is needed in large quantities to accomplish the goals. This can make the storage and use of it particularly dangerous. If the containers that store this chemical aren't maintained properly, it can result in explosions, dangerous leaks, or other problems. Anyone company that has a need to use anhydrous ammonia needs to have a detailed safety plan in place to avoid potential catastrophes. In addition to being a smart thing for the business and employees, it is also a requirement from OSHA. Planning out the safety processes ahead of time, and keeping them up to date at all times, will help ensure a facility can operate without any ammonia related incident for years to come. This will typically start off by identifying the specific hazards associated with this chemical, and providing training to all employees and others who may work with or around it. In addition, learning how to prevent problems, and what to do in the event of an issue, will also help to keep employees and the facility safe for everyone. One of the most important ways to ensure anhydrous ammonia is kept safe is by using proper labeling and signs. Labeling and signs should be applied to all machines that use this chemical, all storage containers, transport vehicles, and pipes that move it. When done properly it will help ensure everyone can easily identify areas where anhydrous ammonia exists so they can respond properly. Larger containers will typically need a number of markings to ensure people can see them from throughout the area. Using signs that have larger text and bold colors can help allow people to quickly identify what is in a container, even from a distance. Pipes are used to transport anhydrous ammonia throughout many facilities. 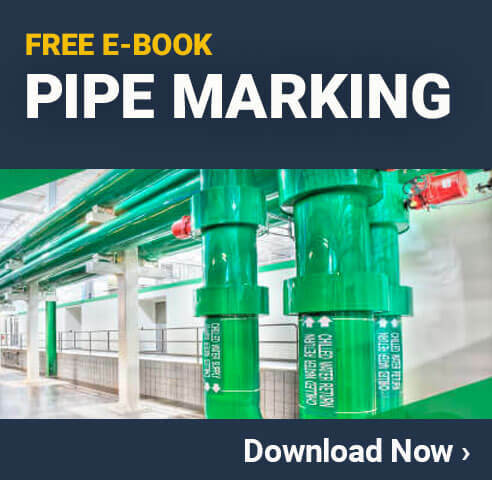 When this is done, it is absolutely critical to ensure they are properly marked so people don't mistakenly release the ammonia into the area when either opening a pipe, or working on or around them. Following a strict anhydrous ammonia pipe marking strategy is the best way to avoid accidents. 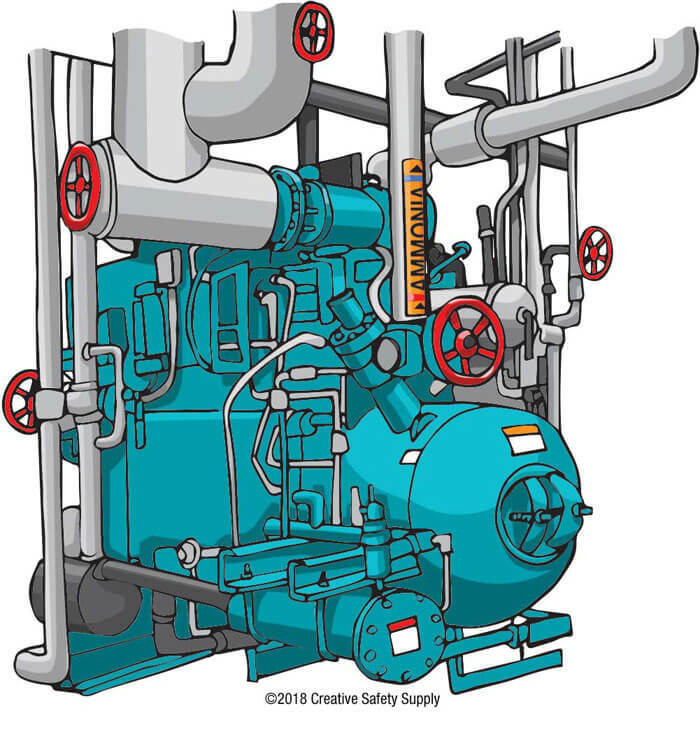 Pipes should be labeled clearly, and identify key information about the ammonia. Specifically, it should be clear whether the ammonia is in liquid form or gas form, the direction of the flow should be identified, and any other pertinent information. Making sure that there are labels on the pipes ever few feet will also help to avoid the risk of someone approaching a pipe in an area where there is no label alerting them to the dangers. A good option for most facilities is to have an industrial label printer onsite so new labels can be printed as needed. As new pipes are run, or old labels wear out, this will allow the new labels to be printed and applied immediately so there is no time when an ammonia containing pipe is not properly labeled. This will help to improve overall safety, and ensure the facility remains in compliance with OSHA and other regulations. Any facility that uses anhydrous ammonia needs to make sure they are providing all their employees with proper safety training. Exposure to this chemical can cause burns (frostbite), respiration issues, and more. If exposure is likely, employees should be wearing full personal protection equipment that will cover all skin, and include a full-face respirator that includes ammonia cartridges and pre-filters. In most cases, working around this type of ammonia won't result in any type of exposure unless something goes wrong. If this occurs, employees need to know exactly how to respond in order to remain safe. Serious injuries can result within just seconds of exposure, so knowing to evacuate the area immediately, how to wash off any exposed skin, and other safety tips is essential. This type of training should be provided to employees upon hire, and refreshed regularly to help keep them safe.